Mercury Blvd in Hampton, Virginia is a treasure trove of thrift stores. Since I've got the clean up and reorganize bug, maybe everyone else does too and the local thrift stores would be the beneficiaries of all this industriousness. I have already taken several bags of discards to the Goodwill myself. It was a fruitful stop at the DAV Thrift on Mercury today. I walked away with this drop dead gorgeous vintage coat. I believe that it is persian lambs wool and the collar is either mink or fox. Typically you see this type of fur in black but this is a lovely mix of colors (which totally does not show up in my pics) that I'm going to call salt and pepper. Like the miniature schnauzers we had when I was growing up. This jacket came from a furrier in Norfolk, VA and they still have a store in Virginia Beach. Next week I will take the coat over there and have them tell me more about it. The condition is pristine, it truly appears to have only been worn for, perhaps, special occasions. It only took me a few minutes to debate whether or not to make the purchase, but the clincher was the inside. The lining is a silvery grey satin and look at this pocket! 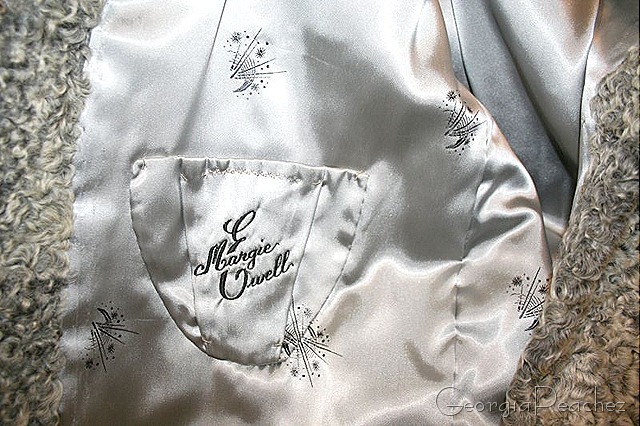 The owners name is embroidered in this fabulous script and look how they matched up the details in the lining fabric. sigh. This beauty wasn't my only jackpot score. I also found a distressed velvet jacket and a couple of great skirts, package of vintage trims and a frame kit. My favorite place to dig in this thrift is the bins of craft supplies. I had to patiently wait while another patron blocked the entire aisle with her cart while she dug through each bin once, then reversed herself and went back through them again. arrrrgghhh. 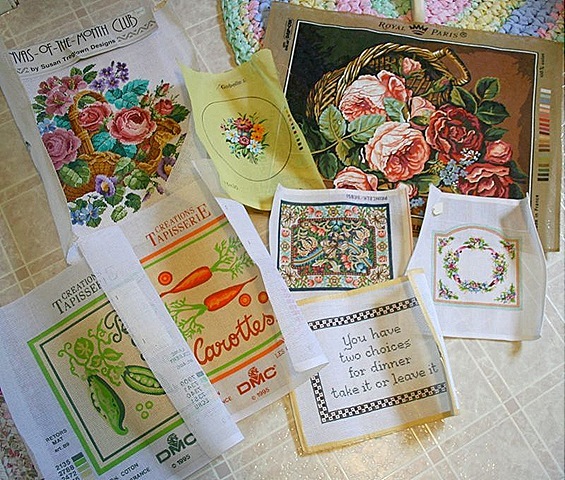 Once she was done I dug around and came up with a roll of needlepoint canvases. I quickly peaked at just one of them, threw them under my arm and headed for the checkout. I'm not an expert on needlepoint, though I have dabbled. But I do know how expensive handpainted canvases are. There were eight canvases in the roll. Most of them are french, one is german. I researched them on the internet and found out they are all from well known artists and they are worth some serious $$$. I got the lot for $5. I know. damn. Tomorrow is the last day to leave a comment for the apron giveaway. Thanks to everyone that has left a comment so far. Good luck! Nice needlepoint find! I’m glad that other lady left them for you. The coat is great – I just hope that’s not schnauzer fur. That coat is incredible! WOWZER! I was going to some thrift stores today but decided it was too cold….I may get out tomorrow no matter what! I need a thrift store FIX! You did GOOD! If the coat is too big for me ….let me know! heeheehee! I meant to say too big for YOU! lol I got excited! That coat is great! I love wearing vintage. Woohoo! It is amazing what we can find!! Love your coat!! What wonderful finds, I love the coat and very different color, most are black. What a score you go girl! I ADORE the pretty lining inside the coat the best. Hmmm…wonder if you can turn that coat inside out and wear it? Talk about warm and fuzzy! (Of course I’m kidding, but I did think seriously about it for a momement. Here in Ohio, now, it is -13 degrees.) I love your site! I am both pea green with envy and thrilled to my tippee toes for you. Two amazing finds! You have to know though, that having the talent to find these things counts too. How many people walked right by and didn’t take a second look. The coat is to die for. Three words, Suzy…FAB U LOUS! That is an awesome score. Good for you! Wow, gigantic finds! Oh how I wish I were there, but not behind the lady blocking the aisle! By the way, I LOVE YOUR BANNER with the little paper umbrellas and thread spools. Simple, creative and so charming! Amazing coat – and after noticing the name embroidered inside…that is just too cool. SCORE! Ohhh…the lady with the shopping cart would have driven me bananas. I usually try and squeeze my way in…and would ask her to move her cart…sometimes people just don’t get common courtesy!!! At least you scored with the needlepoint! Lovely coat. Mercury Blvd does have a great Thrift selection. I haven’t been over to Hampton in a while, looks like a trip will be coming soon. What a Grand Find,the Coat is Amazing! Only a Seamstress would notice the matching design of the pocket,Good eye! do let us know the history! I would have been too impatient and just squeeeeezed myself into a spot and started digging. Just put on your crazy face and jump in there. I’ve learned this after being the “nice” one in the thrift store way too long. Now I’m just one more crazy old lady, fightin’ for the good stuff. You really scored – and still retained your classy reputation. Love the coat and great score on the needlepoint. I love the one about dinner – take it or leave it. 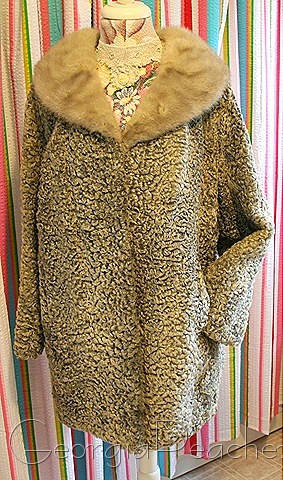 Gorgeous Persian lamb coat, and the collar is mink. Lucky you! The coat is gorgeous! What a score! I would be wearing it everywhere! Lucky you! Good evening. As I get older, I’ve learned to listen to people rather than accuse them of things. Greeting. It is fortunate to be of high birth, but it is no less so to be of such character that people do not care to know whether you are or are not. 🙂 Thanks in advance. Xandy.